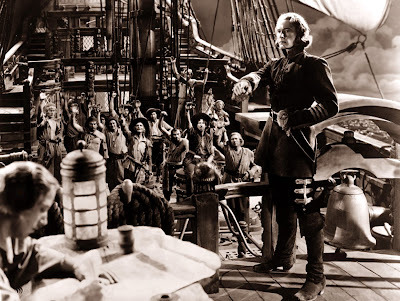 Cinema OCD: Eye Candy of the Day: Long live the articles of Piratization! Eye Candy of the Day: Long live the articles of Piratization! 1) All men shall make equal share of the treasure. Any man caught hording more than his rightful share will be banished from the crew. Those injured in battle shall receive additional compensation for their injuries. Loss of a right arm=500 dubloons. Loss of a left arm=300, Loss of a right leg=400, loss of a left leg=200, loss of an eye=300. 2) No man shall do harm to another on this crew or any other person under the protection of these articles. Those caught in harming another will be banished from the crew. 3) No man shall hold a woman against her will. Any man caught doing so will be banished from this crew. 4) No ship on the seas is safe from plunder, but those under the protection of these articles. We mean to take treasure from every ship we encounter, but will use no more force than is necessary to subdue them. Any man caught using undue force will be banished from this crew. Those in favor, say aye! Long live the articles of piratization! It's like Everything I Need to Know I Learned in Kindergarten, for pirates. Chicken Soup for the Pirate Soul. Who Moved My Booty? Tuesdays with Errol. Captain Marley and Me. Ah, wisdom for living. Think Errol'd go on Oprah? I'm inspired, and going to piratize my life. There is nothing better than Errol Flynn - in the past and in the future. The NEW generation of Errol Flynn FANS is alive and well. Please name me one who could ever come close to him? None! Wuthering Heights: Take any form. Drive me mad.